Business and consumer demand for smartphones is growing rapidly, but no single mobile operating system will rule the market in the way that Windows dominates personal computers. That's according to a new study by market researcher IDC, which predicts that as many as five mobile operating systems will compete globally by 2014, including Symbian, BlackBerry OS, Android, iOS (iPhone), and Windows Mobile. "IDC believes the market will comfortably support up to five OS players over the next five years," said IDC mobile analyst Kevin Restivo in a statement. "Shorter replacement cycles and an ample feature phone to smartphone upgrade opportunity means the smartphone OS market will remain fragmented but healthy for the foreseeable future." Here's how IDC sees the mobile OS market in 2014 (See chart below.). 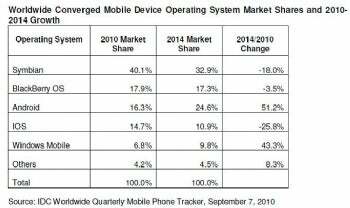 Symbian is still on top with roughly a third of the market, while Android has surged into second place. BlackBerry, holding its own, is down a bit. Note iOS's significant slide as well as Windows Mobile's resurgence, the latter apparently based on the expectation that Windows Phone 7 and its successors will be a hit. For businesses, a competitive mobile OS market is a good news/bad news scenario. The good, obviously, is that cutthroat competition should help lower the cost of phone hardware, as well as security and management tools. The bad is that supporting multiple operating systems could prove a managerial migraine for IT departments. A recent Forrester survey shows that businesses are already revising their client computing strategies to incorporate smartphones from multiple vendors. One reason is that it's easier to attract top employees if you let them use their favorite smartphones for business and personal use. And while that strategy may work for the front office, it's a challenge for IT staffers who must keep up on security threats on multiple OS platforms. Contact Jeff Bertolucci via Twitter @jbertolucci or at jbertolucci.blogspot.com .